Some of the nation's biggest department stores, including Bloomingdale's, Nordstrom, Sears and Walmart have been selling lead-tainted jewelry, and others are offering contaminated toys, including the Hello Kitty brand, a health advocacy group reports. The Center for Environmental Health, a California-based non-profit that crusades against the use of toxic chemicals in consumer products, says at least three retailers that sell children's products carry items with lead. 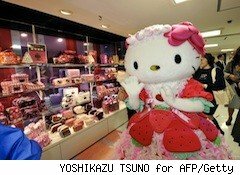 The stores -- Sanrio, T.J.Maxx and Big Lots -- were notified by the California Attorney General's office that a Hello Kitty doll dress-up set, an NFL lunchbox, and a backpack that they've been selling violate federal consumer product safety laws.The attorney general has also alerted Styles for Less and the other big-box department stores regarding the sale of a necklace that contains four times the legal limit for lead in adult jewelry. Sears has said it has pulled the item from its shelves. CEH's recent testing also found that ToysRUs.com has been selling a children's reusable shopping bag that is tainted with lead. The company has discontinued the product since the discovery. An earlier investigation by the group found alarmingly-high levels of lead -- 30 to 100 times higher than the federal limit for all children's items -- in women's purses sold at H&M and New York & Company. The substance, which has been linked to cancer, birth defects and other health problems, is used to soften leather and make its color last longer, but can easily rub off on hands or food items and become ingested. "Our hope is to erase all of the hidden lead hazards in stores, but for now it's an almost lead-free holiday season," said Caroline Cox, research director at the CEH. The organization is holding a series of free toy-testing events through Christmas in Oakland, Marin, Berkeley, and San Mateo, Calif. It contributes to the www.healthystuff.org database, which lists the toxic hazards in thousands of consumer products.